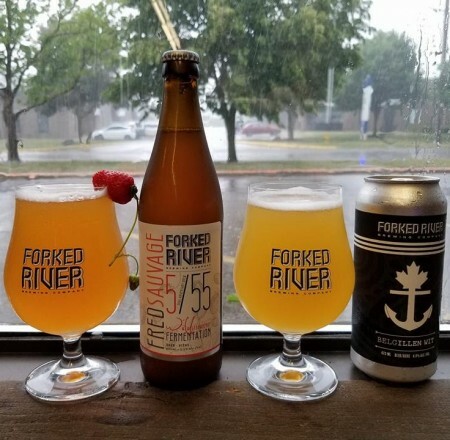 LONDON, ON – Forked River Brewing has announced the release of two beers created in partnership with local businesses to celebrate the brewery’s 5th anniversary. Using I&G raw honey, along with coriander and bitter orange, this wonderful summer beer has a refreshingly gentle spicy and citrusy finish. It’s the perfect beverage to celebrate London partnerships and a success stories like Illbury + Goose and Forked River. We put all our eggs in Heeman’s strawberry basket, trusting this batch of beer completely to the wild yeast and microbes found on their delicious berries. Over 200 lbs of strawberries were puréed and mixed with fresh wort, then left to spontaneously ferment with whatever magic Mother Nature gave to the beer. And you know what? The high-stakes risk payed off. Almost three months later, the result of this wild fermentation is a tart and funky strawberry ale, complex with a myriad of flavours that the micro flora of Heeman’s renowned strawberry fields bestowed upon the brew. Both beers are available now via the Forked River online store, and at the brewery while supplies last.